All Web addresses mentioned were functional as of 5-19-17. From the Cumberland Gap to the Atlantic Ocean, this is Virginia Water Radio for the week of May 22, 2017. This week, we re-visit a mysterious, annual calling of the names—names that, if we’re lucky, will not become infamous this summer or fall. Have a listen for about 25 seconds, and see if you can guess who—or rather, what—is being named. GUEST VOICES - ~25 seconds - Arlene! Bret! Cindy! Don! Emily! Franklin! Gert! Harvey! Irma! Jose! Katia! Lee! Maria! Nate! Ophelia! Philippe! Rina! Sean! Tammy! Vince! Whitney! If you guessed tropical storms or hurricanes, you’re right! 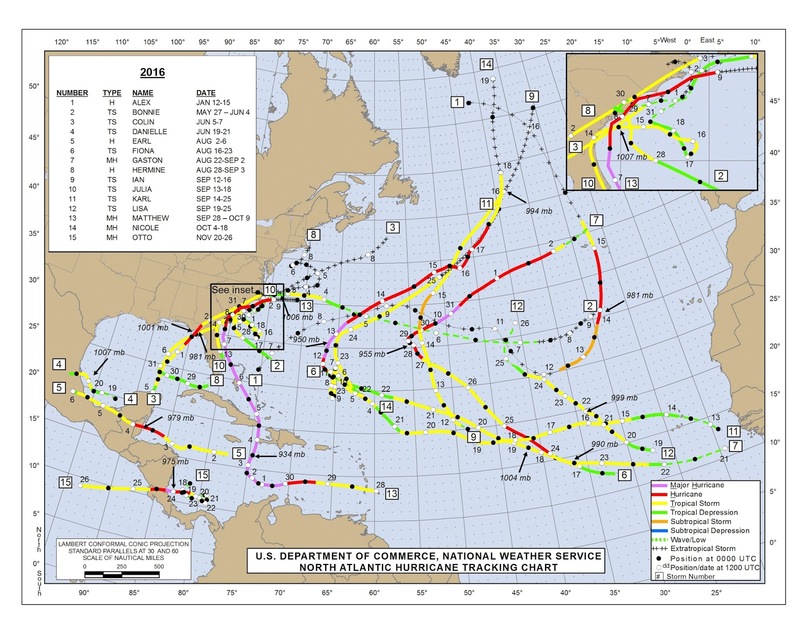 Those are the names planned for the 2017 tropical storm season in the Atlantic basin, covering the Atlantic Ocean, Caribbean Sea, and Gulf of Mexico. The season runs officially from June 1 through November 30. But tropical storms don’t always follow the official calendar. For example, this year, the Atlantic’s first named storm—Tropical Storm Arlene—formed in April; and in 2016, Hurricane Alex formed in mid-January, the earliest for an Atlantic hurricane to form since 1938. Tropical storms and hurricanes are two categories of tropical cyclones—counter-clockwise-rotating storm systems that start in tropical or sub-tropical latitudes. A tropical cyclone is called a tropical storm—and gets a name—when sustained wind speeds reach 39 miles per hour [SOUND – 2 sec - wind]; at 74 miles per hour, a tropical cyclone is considered a hurricane [SOUND – 3 sec - louder wind]. Tropical depressions—with wind speeds below 39 miles per hour—don’t get names, but they can still bring heavy rainfall and flooding. Before a tropical system of any speed or name barges into the Old Dominion...[SOUND – 3 sec – wind, rain, thunder]...you can get ready by making a written emergency plan, including an evacuation plan; assembling an emergency kit of food, water, and supplies; preparing your home for high winds; and establishing ways to stay informed, especially if the power goes out. Detailed safety tips for tropical storms and other severe weather are available from the “Safety” link at the National Weather Service Web site, www.weather.gov. Hurricane Preparedness Week for 2017 was May 7-13, so now’s the time! Thanks to 21 Virginia Tech faculty and staff for lending their voices to this episode. “Tropical Tantrum” is copyright 2017 by Torrin Hallett, used with permission. As of May 2017, Torrin is a fourth-year student at Oberlin College and Conservatory in Oberlin, Ohio, majoring in horn performance, music composition, and math major. More information about Torrin is available at his Web site, http://www.torrinjhallett.com/. Thanks very much to Torrin for composing the piece especially for Virginia Water Radio. 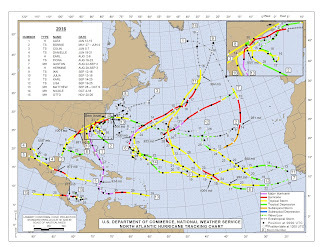 Names and tracks of Atlantic tropical storms in 2016, according to the National Hurricane Center, online at http://www.nhc.noaa.gov/data/tcr/index.php?season=2016&basin=atl. Tropical Storm Arlene in the mid-Atlantic on April 21, 2017, 7:45 a.m. EDT. Puerto Rico is visible in the lower left corner of the photo. 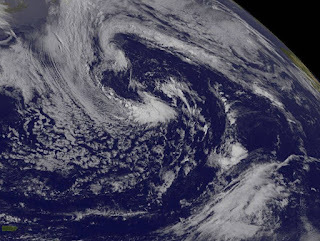 Photo from the GOES-East satellite, NASA/NOAA GOES Project, in “NASA Satellite Animation Shows Tropical Storm Arlene "Eaten" By Weather System,” 4/22/17, online at https://www.nasa.gov/feature/goddard/2017/td1-atlantic-ocean. The following information is quoted from the National Weather Service’s “Hurricane Preparedness Week 2017” list of tips for each day of a week, online at http://www.weather.gov/wrn/hurricane-preparedness#prepweek. Day 1 - Determine your risk. Day 2 - Develop an evacuation plan. Day 3 - Assemble disaster supplies. Day 4 - Secure an insurance check-up. Day 5 - Strengthen your home. Day 6 - Check on your neighbor. Many Americans rely on their neighbors after a disaster, but there are also many ways you can help your neighbors before a hurricane approaches. Learn about all the different actions you and your neighbors can take to prepare and recover from the hazards associated with hurricanes. Day 7 - Complete your written hurricane plan. National Aeronautics and Space Administration (NASA), “NASA Provides in-Depth Analysis of Unusual Tropical Storm Alex,” 1/15/16, online at http://www.nasa.gov/feature/goddard/2016/alex-atlantic-ocean. National Hurricane Center's main Web page, online at http://www.nhc.noaa.gov/. This site provides bulletins, maps, and other information on tropical storms as they are occurring. National Hurricane Center, “Hurricane Preparedness Week 2017,” online at http://www.weather.gov/wrn/hurricane-preparedness. National Hurricane Center, “NHC Data Archive,” online at http://www.nhc.noaa.gov/data/. National Oceanic and Atmospheric Administration (NOAA), “Tropical Cyclone Names,” online at http://www.nhc.noaa.gov/aboutnames.shtml. National Weather Service, “Hurricane Safety Tips and Resources,” online at http://www.nws.noaa.gov/om/hurricane/index.shtml; and “What is a Tropical Cyclone?” online at http://www.nws.noaa.gov/os/hurricane/resources/TropicalCyclones11.pdf. Doyle Rice, “Arlene forms as only the second tropical storm on record in April,” USA Today, 4/20/17. American Red Cross, “Hurricane Preparedness,” online at http://www.redcross.org/prepare/disaster/hurricane. Virginia Department of Emergency Management, “Hurricanes,” online at http://www.vaemergency.gov/readyvirginia/stayinformed/hurricanes. The department's “Know Your Zone” Web site for evacuation planning is at http://www.vaemergency.gov/hurricane-evacuation-zone-lookup/. Virginia Water Central News Grouper posts on news, events, and information resources about hurricanes and other tropical storms, online at https://vawatercentralnewsgrouper.wordpress.com/?s=hurricane. Episode 345, 12/5/16 - season review episode.